Delacroix, La. ? Tropical Storm Isidore blew ashore Thursday with near hurricane-force wind, spinning off tornadoes, swamping the Gulf Coast with 15 inches of rain and knocking out power to more than 200,000 homes and businesses. Thousands fled their homes in Louisiana, Mississippi and Alabama before the storm reached land at 3 a.m. Floodwaters swept through houses in communities across the region and rose to the windshields of cars in low-lying New Orleans. “I don’t know whose they are, but I’ve got three recliner chairs in my yard,” Susan Serpas said in Delacroix, a fishing town east of New Orleans, where screen doors, mailboxes and furniture bobbed in 3 feet of water. Gov. Mike Foster said the storm did at least $18 million in damage in Louisiana, including $3.7 million in lost sugar cane. Foster said the damage estimate would grow, and he was seeking a federal disaster declaration. Isidore packed winds up to 65 mph when it arrived, below the 74 mph threshold of a hurricane. The storm lost its punch and was downgraded to a tropical depression as it moved past Jackson, Miss., in late afternoon. Forecasters said the storm would slide into the Ohio Valley by the weekend, bringing heavy rain to the Midwest and the Northeast. Up to 8 inches of rain were forecast in Tennessee. Several tornadoes spun out of the storm and touched down in the Florida Panhandle. One hit a barn near Graceville, Fla., injuring a farmer, while another damaged more than 20 homes in Santa Rosa Beach. Mississippi officials said floodwaters kept them from reaching a 67-year-old man who died of cardiac arrest early Thursday. Mississippi kept its floating casinos shuttered. One, the Treasure Bay in Biloxi, sustained a 12-foot gash when the surging sea drove its entrance ramp deep into one of its walls. Backup security cables kept the casino barge from floating away. 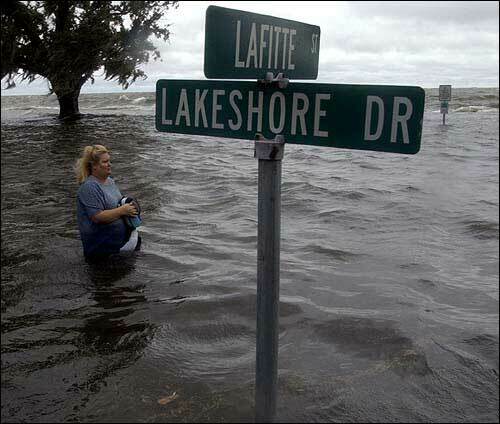 Virginia Williams watches Lake Pontchartrain rise as Tropical Storm Isidore blows ashore in Mandeville, La. Isidore dropped 15 inches of rain on the Gulf Coast Thursday and caused at least 8 million in damage in Louisiana. The storm is expected to move into the Ohio Valley this weekend, bringing heavy rain to the Midwest and Northeast.